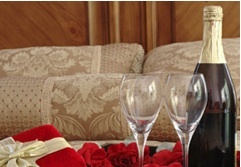 Home Market Deals has a list of suggestions to get you started on a romantic path this February 14th! Strategically place an AmbionAir Flame wall mounted electric fireplace in the bedroom (or any other room) where you can benefit from the ambiance and warmth. With a wall mount electric fireplace you will appreciate the versatility of design and installation, placing it wherever you want to create an intimate tone and atmosphere. Set the mood by playing some soft, romantic music. Classical music is usually a safe bet, as are jazz and soul. Fill the room with a dramatic array of flowers to add visual interest as well as inexpensive elegance. It can be your favorite flowers or something more traditional like roses. Since ancient times, the rose has been a symbol of love, passion, and perfection. Show your love and sensitivity by choosing a rose by its name and not just by its color or fragrance. Compose a poem or personalize a card with a written expression of your love for your significant other. What you love most of this person, how it happened that you fell in love with this person, how they have enriched your life, etc. Inspire yourselves by watching a romantic movie together, like: The Notebook, Casablanca, An Affair To Remember, Somewhere In Time, Titanic, Ghost, Pretty Woman, The Princess Bride, The Holiday, Doctor Zhivago, Braveheart, Sleepless In Seattle, Romeo and Juliet, The Lake House, Roman Holiday, Breakfast At Tiffany’s or An Officer And A Gentleman. Dr. Max Lake, author of the book Scents and Sensuality, the aromas of certain wines can spark arousal. Earthy scents of red wines come closest to resembling male pheromones (which signal attraction in the brain), whereas female pheromones are best represented by the earthy scents found in white and sparkling wines. Do you have other ideas on how to stir-up some romance? Share your comments with us!